The 14 largest Cloud Computing vendors continued to gain shares in 2017, now accounting for 23% of the entire enterprise IT spend, up from 17% in 2016, as they expanded organically or through acquisitions in their bid to best their Cloud competitors and leapfrog the on-premise alternatives along the way. The December 2016 acquisition of LinkedIn by Microsoft catapulted the Windows developer to the No. 1 spot in the Cloud Computing space, edging past Amazon, the former No. 1 Cloud leader in Infrastructure As A Service, and Salesforce, which still holds the No. 1 spot in the Software As A Service category. However the steady growth of LinkedIn and the above-average performance of Microsoft Azure have given more credence to keeping Microsoft as the favorite to lead in Cloud Computing because of the breadth of its offerings. On the other hand, extending the ubiquity of Oracle Database at the enterprise level to the Cloud is expected to be a major development that could shape the Platform As A Service(PaaS) category. It’s safe to assume that the steep costs of delivering Cloud infrastructure will limit the number of viable IaaS players, the PaaS and SaaS categories are in flux and incumbents and disruptive forces will continue to trade places in more than 100 PaaS and SaaS segments being tracked closely in our vendor database. Already, recent acquisitions of Aconex by Oracle, Callidus Cloud by SAP and MuleSoft by Salesforce – coupled with Workday’s heavy investment in PaaS with a $250 million venture fund – underscored the fact that the other 13 heavyweights – all belonging to the exclusive Cloud Computing Billionaire Club – are plowing ahead to close in on Microsoft. The intensity of the fight is playing out against the backdrop of a gradual shift to Cloud Computing, away from on-premise Enterprise IT products such as conventional middleware for complex integration and heavily-modified ERP applications for process automation. Instead, customers are gravitating toward API integration for easier data capturing and online content delivery and presentation. The multi-tenant capability of serving up Cloud applications to different customers all at once leaves little room for customization, but it allows for a steady flow of new features – mostly requested by end users – that are updated regularly, sometimes as frequently as every few months. These 14 Cloud Computing Billionaires have been able to consolidate their gains through heavy R&D investments and expensive acquisitions to improve those features, while seeking every opportunity to exercise their pricing power and incumbent advantages to keep competitors at bay. Consider last year’s move by Salesforce to lower the fees ISV partners need to pay Salesforce in order to become part of the Salesforce platform and ecosystem and start selling on the AppExchange network. Instead of 25%, ISVs now pay 15% of their revenues for selling their products on the Salesforce platform. Salesforce said the reduced fee structure will make the Salesforce platform more attractive to smaller ISVs, compared with what they have to pay for other ecosystems. The fact that Salesforce decided to lower the fees underscores its desire to stay competitive in an increasingly crowded PaaS marketplace where the ultimate winners will be those that are proven to be easy, flexible and value-driven to do business with. This year’s results are based on our annual survey of more than 3,000 Cloud Computing vendors as we track their product revenues across different Cloud categories as well as 21 verticals and dozens of enterprise applications segments as shown in the Taxonomy section below. The results are further validated by products that have been recently purchased and implemented by companies in our Buyer Insight Database, which covers more than 180,000 organizations around the globe. Buoyed by its $26-billion acquisition of LinkedIn in December 2016, Microsoft edged past AWS to become the No. 1 Cloud Computing vendor for the first time. The LinkedIn business contributed $4.7 billion in total revenues to the Windows developer’s top line in calendar year 2017. Exhibit 1 shows the market shares of the Top 14 Cloud Computing vendors in 2017 as they collectively secured more than $76 billion in annual recurring revenues, or 62% of the $122-billion Cloud market, which covers PaaS, IaaS and SaaS delivery. In addition to Microsoft’s increased market share(from 9% in 2016 to 15% in 2017), almost every one of the top Cloud Billionaires has gained ground in 2017. Amazon’s share spiked from 10% to 13%, Salesforce’s unchanged at 8%, IBM’s went from 6% to 7%, Oracle’s rose from 4% to 5%. Adobe, Workday, ServiceNow, Alibaba, FIS/SunGard, and Athenahealth all saw their market shares unchanged from 2016 to 2017 as the overall Cloud Computing market grew 12% from $109 billion in 2016 to $122 billion in 2017. Dropbox, which filed for its IPO in February 2018, was the newest entrant to the Cloud Computer Billionaire Club. Exhibit 2 shows the 2016 and 2017 Cloud revenues of the 14 top vendors by Cloud product category and their key Cloud Computing offerings for PaaS, IaaS and SaaS delivery. SaaS 1097 1535 40% ServiceNow IT Service Management, IT Operations Management, IT Business Management, Software Asset Management, Performance Analytics, Customer Service Management, Security Operations, GRC, and HR Service Delivery applications. Notes: Microsoft’s results cover trailing four quarters ended December 31, 2017. Salesforce’s results cover trailing four quarters ended January 31, 2018. Oracle’s results cover trailing four quarters ended February 28, 2018. Adobe’s results cover trailing four quarters ended December 1, 2017. Workday’s results cover trailing four quarters ended January 31, 2018. Alibaba’s results cover trailing four quarters ended December 31, 2017. All others cover calendar 2016 and 2017 results. In 2017, Microsoft, riding on the unflagging popularity of LinkedIn among professionals, soared to become the No. 1 Cloud Computing provider. The combination of Microsoft Azure for IaaS, PaaS, Azure SQL Database, and Dynamics 365 for Cloud productivity tools, CRM and ERP applications for SaaS delivery, has transformed the PC-centric company to one that banks its future on the Cloud. The latest KPIs are nothing but impressive. In its latest quarter, Microsoft’s Office 365 Commercial revenues surged 41%; Dynamics 365 revenues, which include Dynamics CRM and ERP, jumped 67%, while Azure nearly doubled its revenues at a growth rate of 98%. LinkedIn contributed revenue of $1.3 billion during the quarter. All of the above products were factored into our calculation of Microsoft’s Cloud Computing revenues either in full(as in the cases of Office 365 Commercial, Dynamics CRM and Azure) or in part(as in the cases of Dynamics ERP and LinkedIn.) Some of Dynamics ERP products are still being sold as on-premise implementations, according to Microsoft partners. LinkedIn’s premium subscription revenues for additional tools like InMail and visibility into visitors to one’s LinkedIn page is not counted because it’s sold more like a consumer service and there are no comparable products from its enterprise competitors. The key takeaway from its Cloud performance as shown in its recent 10Q is that its commercial Cloud is on track to become a $20-billion business. This should give Microsoft’s plenty of runway to extend its lead over its competitors. Dynamics 365’s robust growth can be attributed to the stranglehold of Microsoft Office has within the enterprise, buttressed by the staggering amount of Excel, Word and PowerPoint assets that knowledge workers have invested through the decades. Despite a decade of heavy investments from Google to wrest control of content creation from Office with Google Docs, Microsoft’s tried-and-true formula of adding value consistently has bode well for Office’s migration to the Cloud. The expansion of Dynamics 365 is continuing unabated, enabling LinkedIn users to improve their career profiles by using tools like Resume Assistant, which is part of Office 365. Similarly, LinkedIn Recruiter is now integrated into Dynamics 365 for Talent for recruiting and onboarding. Azure, which is grouped under Microsoft’s Intelligent Cloud, has been on a roll after the vendor invested more than $15 billion in 100+ data centers and other regional hubs for infrastructure support and delivery around the world. The Azure Premium Services, which enable enterprise customers to take advantage of built-in features like Azure Cosmos DB, Azure SQL Database, Azure Databricks, IoT and AI services to drive their digital transformation efforts, have been growing at triple-digits every quarter consecutively for the past two years. At the same time, Microsoft’s army of 750,000 partners including more than 17,000 Cloud Solution Partners have been instrumental in helping enterprise customers leverage Azure to replace or augment their existing infrastructure. Rackspace alone hosts over 35,000 SQL databases on Azure for its customers. With some 120,000 new Azure customer subscriptions per month, Microsoft has the scale and the pricing power to make its array of Cloud infrastructure services pervasive and sticky. In January 2018, Microsoft cut the price of its standard technical and billing support service for Azure by 67%, slashing the monthly cost from $300 to $100, while boosting the Service Level Agreement from an initial response time of two hours to one. Similarly, Azure Hybrid Benefit allows Windows Server and SQL Server customers to take licenses with active Software Assurance to Azure services for up to 30% discounts over list price. All these underscore the fact that Microsoft’s successful Cloud push has entered a new phase of not just capitalizing on its gains, but also seizing every opportunity to end run its competitors with complementary products and cutthroat strategies. In 2017, Amazon posted a 41% jump in AWS revenues after a 38% increase in 2016, highlighting the eCommerce leader’s ability to extract organic growth from an already huge installed base, which covers millions of customers around the world. With the largest IaaS footprint in the world, AWS now covers 114 Points of Presence and 52 Availability Zones in 18 different regions with plans to open 12 more Availability Zones and four regions including Bahrain, Hong Kong, Sweden and a second GovCloud in the United States. Despite such investments, AWS remains the most profitable part of Amazon racking up a 25% margin, compared with low single digit or repeated losses at its North America and International divisions, respectively. That alone shows that AWS has almost perfected the art of delivering Cloud infrastructure service at scale. In 2017, AWS invested heavily in AI, Machine Learning and Alexa-powered services including Alexa for Business, which features voice assistance for managing work calendar. In ML, AWS launched SageMaker, which allows users to accelerate machine learning production. AWS DeepLens, a hardware and software bundle, enables users to run deep learning on the camera to spot changes through object/face detection or activity recognition. The AWS ecosystem continued to expand with the Amazon Partner Network now covering tens of thousands of partners including more than 10,000 that signed up last year. The AWS Marketplace now has 4,200 software products from more than 1,280 ISVs. The outlook of AWS may have less to do with its increased momentum(4% contribution to Amazon’s top line in 2012 growing to 10% in 2017), but rather how it shapes the company’s future as a whole. Amazon’s acquisition of grocer Whole Foods with its razor-thin margin could be a drag on its earnings for quite some time and AWS’ stellar performance and hefty margins may stand as a stark contrast. What ends up happening is that AWS could become the tail that wags the dog or the business unit that gets the most scrutiny given the high expectations. After completing a record-setting run as the fastest growing company to reach $10-billion in sales, Salesforce is bracing for the next milestone as the CRM leader eyes to chalk up $20 billion in revenues over the next few years. The ambition is fueled by its March 2018 announcement to acquire MuleSoft for its Cloud integration offerings. Despite paying a princely sum of $6.5 billion(or 22 times MuleSoft’s 2017 revenues), Salesforce added another key underpinning to its PaaS strategy. The question is whether its expansive PaaS strategy will sit well with other vendors, which now might consider their use of MuleSoft for Cloud integration as competitive to their SaaS applications or Cloud strategy for that matter, as opposed to complementary when MuleSoft was still independent. The proposed acquisition of MuleSoft has also ended an extended period of Cloud expansion primarily via organic growth. In its latest fiscal year, Salesforce’s 25% organic growth of product revenues fared well against those that grew largely through acquisitions. Revenues from Service Cloud grew the most in actual dollars in the fourth quarter of fiscal 2018, suggesting Salesforce’s customer service and support software may be gaining share at the expense of weaker players. Its European sales outperformed those of the other two regions, suggesting increased momentum in different parts of Europe. With a slew of new products like myEinstein, myIOT Cloud, myTrailhead, myIoT, myLightning and Live Apps for next-generation Artificial Intelligence, Internet of Things, Dev Tools, User Interface, and interactive collaboration, Salesforce is redefining the meaning of customer relationship management. In many respects, CRM could well become the proxy for running an effective business for the sake of serving real-time needs of customers, employees and shareholders all at once. In 2017, Salesforce put a great deal of emphasis on its Einstein Platform Services for creation of AI-powered CRM applications that make extensive use of customer data already stored in Salesforce systems. Einstein combines advanced analytics, machine-learning recommendation engines, intuitive reporting and Vision and Sentiment APIs to drive better insights and actionable campaigns all within a compressed timeframe using clicks or code. The move furthers Salesforce’s promise of delivering customer-centric applications that are easy to deploy and scale, capable of reaching millions of users. As it approaches the next milestone of becoming a $20-billion Cloud vendor, Salesforce is counting on innovations like Einstein to help sustain its momentum in the CRM applications market for commercial clients, while extending its reach into adjacent areas like financial services, government, healthcare and asset-intensive verticals like manufacturing, automotive and energy where account and transaction data may be more dispersed than ever. For example, U.S. Department of Agriculture Farm Service Agency has recently announced use of Salesforce Service Cloud to develop an outreach program designed to benefit farmers and ranchers. When it comes to all manners of customer engagement from selling to marketing and from service provisioning to channel building, it’s hard to find any product segment not being offered by Salesforce or its partners, which have been utilizing the Salesforce Platform to deliver an increased number of apps and services to their customers in target verticals. For a company that has helped make online software delivery a reality, Salesforce is beginning to reshape the way customers are being served in different industries. IBM posted solid results with an assortment of Cloud offerings in 2017 as the Big Blue announced that its Cloud revenues reached $17 billion and the run-rate for its As A Service offerings hit $10 billion last year. Our estimates are more conservative as IBM’s definition of Cloud revenues also included its services operations. IBM currently offers over 170 services for public, private and local models for accessing its Cloud infrastructure through 60 data centers in 19 countries. Similarly, IBM’s As A Service offerings include a fair amount of security and system revenues that are not part of our taxonomy. What we examine is based on the growth of a number of Cloud infrastructure products, namely SoftLayer and Bluemix, which have been consolidated under the single IBM Cloud brand. One growth area is IBM Cloud becoming the way station for VMware customers – now exceeding 1,400 – to extend their virtualized environment to the Cloud. Additionally, much of the growth of IBM Cloud lies in its different Cloud applications such as Kenexa for HCM, Sterling Commerce for eCommerce, and Cognos for Cloud analytics. IBM Cloud industry vertical app is another focusing on banking, retail, CPG, Media and Entertainment, travel and transportation, and an upcoming solution set for insurance. Recent acquisitions from Merge Healthcare and Truven Analytics have become the building blocks for IBM Cloud apps for healthcare. Such healthcare products now operate under the IBM Watson Health umbrella. With recent purchases like Merge Healthcare and Truven, IBM is beginning to realize the vision of building out IBM Watson Health Cloud by combining clinical, research and social data from different sources into a data-sharing hub in order to help physicians make better patient care decisions. IBM said the vast repository of images from Merge customers could be used to cross-reference the 315 billion data points including 100 million+ patient records already stored in the Watson Health Cloud, which covers lab results, electronic health records, genomic tests, clinical studies and other health-related data sources. The Watson umbrella also covers platform products such as Watson Customer Engagement, Watson Education, Watson Financial Services and Watson IoT offerings, all of which are designed to leverage AI, machine learning and natural language processing technologies that are becoming building blocks of IBM’s Platform As A Service offerings. Additionally, IBM Blockchain has emerged as an important new technology that’s increasingly driving vertical solutions, particularly in finance. What’s clear is that IBM’s delivery of products through public and private Clouds remains highly differentiated because of its industry expertise, ability to wrap services that allow for quick prototyping and even faster rates of success because of considerable technical, expert and developer support that perhaps only IBM can muster. After establishing an enviable lead in the database market for four decades, Oracle is taking a methodical approach to support many more customers and their Cloud Computing needs. 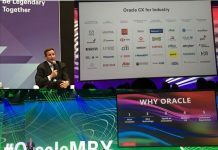 At the business process level, Oracle has invested heavily to build its own Cloud applications for CRM, ERP, SCM, and HCM functions along with a smattering of acquired assets including recent deals like NetSuite for midmarket ERP and Aconex for Cloud apps for construction companies. Currently Oracle’s Cloud SaaS account for the bulk of its Cloud Computing revenues, but the vendor is placing a big bet on both the IaaS and PaaS categories. In IaaS, Oracle feels it has a good shot of displacing incumbents because of its depth of knowledge in areas like networking, security and hardware after spending years of building high-performance servers such as Exadata. In PaaS, Oracle has little to fear because of its robust offerings in middleware, Java and its flagship database offerings. The latest is 18c, part of its Autonomous Database offerings that became generally available in March 2018. Everything about Oracle’s IaaS, PaaS and SaaS offerings will reinforce each other’s strengths in the Cloud Computing era, similar to what Oracle endured and prevailed by winning the on-premise applications race by acquiring PeopleSoft and Siebel and integrating them successfully into the Fusion roadmap, which takes full advantage of its database. As a result, Oracle has every incentive to extend its franchise in hopes of winning a big chunk of the IaaS and PaaS markets. With the help of its robust database technology, Oracle’s IaaS strategy rests with building the data center of the future with a host of services and technologies that piggy back on its Autonomous Database. The construct is that all the tasks associated with data processing, deployment, Database As A Service, Data Warehouse As A Service, DevOps, and analytics will be integrated, provisioned and fully tested and tuned to one’s specifications – all done autonomously to save time and labor while optimizing ROI. Second, such an extension will help facilitate the enterprise lift and shift that is underway for Oracle customers to redistribute their workloads, again outsourcing both Oracle and non-Oracle workloads that encompass an assortment of databases, applications along with emerging technologies like AI/Machine Learning, Blockchain, chatbots, Internet of Things as well as the interplay between physical assets and virtual replicas in what Oracle considers Digital Twin. As SAP kept up its Cloud applications push with organic growth and new acquisitions, the vendor has moved quickly to capitalize on its extensive portfolio of platform products. The SAP Cloud Platform, for instance, allows ISVs, corporate users and developers to build and extend solutions as part of their digital transformation initiatives. For example, food services companies can leverage Internet of Things technologies to make food ingredients widely available to commercial kitchens and consumers by extending a subscription platform that automatically replenishes kitchen supplies on a real-time basis. In February 2018, SAP revamped the pricing for its SAP Cloud Platform by aligning the consumption pattern with actual compute services being used. Under the pay-as-you-go plan, customers will buy Cloud credits that can be applied to platform services being consumed. Using a cockpit, users will see regular metering, reporting and detailed accounting analytics on cloud credit consumption and balance. Similar to other products like SAP HANA, Analytics Cloud and S/4HANA Cloud, the SAP Cloud Platform and its different platform services for Big Data and mobile apps development herald a new era as the vendor expands beyond its traditional software buyers and IT executives to go after anyone that wants to build solutions that incorporate some intellectual property from SAP. Before the SAP Cloud Platform is capable of reaching millions of developers, the vendor is wasting no time to beef up its Cloud applications business. In January 2018, SAP paid $2.4 billion to acquire CallidusCloud for its sales performance management applications including those for incentive compensation as well as a growing array of learning management modules for training all kinds of learners from customers to partners. That followed SAP’s $350 million purchase of Gigya in September 2017 for customer identity and access management, especially useful in its compliance strategy for meeting GDPR requirements, which are becoming law in May 2018 in many parts of Europe for expanding protection of personal data and privacy of EU citizens. In addition to its many Cloud applications like Ariba, Business ByDesign, Concur, Hybris and SuccessFactors that have enjoyed considerable traction with millions of users, SAP is seizing its incumbent position to help it cross-sell and upsell into its massive installed base of ERP and industry-specific applications, all in the hopes of extending its lead over competitors with a hybrid model that marries the agility and flexibility of Cloud software and the durability of its onpremise offerings. Google takes a long view when it comes to scaling out its enterprise business. In competing with Microsoft Office, Google has spent more than a decade fine-tuning different pieces of authoring and collaboration tools like Docs, Sheets and Slides, ensuring their integration into Gmail and Calendar. It wasn’t until 2016 when Google unveiled G Suite, which now includes 17 components including Hangouts for collaboration, Docs, Mail, Vault and different Google Apps for the enterprise. Google also sells Jamboard, a 55-inch digital whiteboard connected to the Cloud for conferencing. Even though Google derives the most revenues from its advertising business, G Suite, Google Cloud Platform and other sources like Hardware and Play are generating billions of dollars in sales every quarter. Our estimates on Google’s PaaS, IaaS and SaaS are based on Google Cloud Platform and G Suite, which together are on a billion dollar run rate every quarter. Alphabet, parent of Google, said it now has more than four million paid customers for G Suite. That covers everybody paying anywhere from $25 per user per month to seven-figures for enterprise deployment of different Google Cloud services. In February 2018, Google announced Hangouts Chat in its bid to compete with Slack, Cisco Spark and other messaging tools. Hangouts Chat’s new features like Meeting Scheduler and Meeting Room Suggestions are tightly integrated into Calendar. Similar to other Cloud services, Hangouts Chat is bundled free into G Suite for paying customers. But anyone can download for free Hangouts Chat from Google Play or App Store. In February 2018, Google acquired LogMeIn’s Xively division for its advanced device management, messaging, and dashboard capabilities. The purchase will help strengthen Google Cloud Platform in its Internet of Things push. Meanwhile, Google Cloud Platform has continued to expand by signing up new developers and ISVs that want to have another option of hosting and managing their Cloud assets. Some ISVs such as Kronos decided to put its Cloud applications on GCP after hearing from objections from their retail customers that rely on Kronos’ applications for mission-critical tasks like time and attendance, scheduling and absence management. Putting their data on Amazon Web Services would not be feasible. Gap, for instance, considers Amazon a competitor and its legal department explicitly bars the retailer from working with anything associated with Amazon. Gap uses Oracle for Cloud infrastructure support. The maker of Acrobat and Photoshop has jumped onto the digital transformation bandwagon with a slew of Cloud-based enterprise applications for marketers, advertisers as well as CRM executives. While its conventional authoring and collaboration tools remain highly popular, Adobe’s future may lie in securing a bigger share of the audience being addressed by its Experience Cloud offerings. For one thing, the Experience Cloud products from Adobe including Marketing, Analytics and Advertising Cloud have twice the addressable market of its authoring and collaboration tools. The attach rates are more pervasive when selling into marketers, BI professionals and advertisers since they often work for large enterprises that have a wide range of digital requirements. The onslaught of social media has also driven demand for Experience Cloud products as marketers aim to win over a new generation of omnichannel consumers that are well-versed in multimedia buying, selling, entertainment options as well as content creation and consumption. In 2017, Adobe officially launched Experience Cloud encompassing the three pillars for marketing, analytics and advertising professionals, while ensuring tight integration among all of its products like Creative and Document Cloud. In other words, the Adobe Suite Experience could soon become the one-stop shop in the Cloud for anyone that wants to add value to ordinary goods and services by transforming the interplay of brand, data, and content into a tidy package. Workday reached a new milestone in fiscal 2018 as its customer count exceeded 2,100 including some 450 Financial Management customers. With more than 2,100 customers, Workday’s flagship Cloud HCM product continues to enjoy tremendous growth winning some of the biggest organizations in the world such as Bank of America, Home Depot and Eiffage. Their growing adoptions – covering tens of thousands of employees at each of these organizations – have translated into considerable recurring revenues for Workday. In 2017, Workday emerged as the largest Cloud HCM applications vendor based on its Cloud HCM recurring revenues, according to our annual HCM Top 500 survey. In addition to HCM and Financial Management, Workday is expanding rapidly into other markets such as analytics and collaboration. In 2018, it acquired SkipFlag for its knowledge management products, following its 2016 purchase of Platfora for analytics that makes sense of external data apart from those within Workday. At the platform level, Workday has invested in a $250 million venture fund that aims to attract a range of startups and established companies to contribute IP and add velocity to its fledgling Platform As A Service ecosystem. 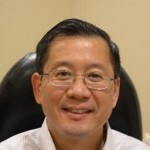 Its long-term success rests on its ability to transition from one that relies heavily on a handful of products to an extensive solution portfolio that not only complements Workday, but also entails tangible value and consistent customer satisfaction, attributes that have propelled the vendor’s ascent in the Cloud applications market over the past few years. Delivering consecutive growth, ServiceNow scored big in the Enterprise Service Management applications market last year after signing more than 100 Global 2000 accounts. With more than 3,600 customers and 17 million Cloud users, ServiceNow has helped transform how enterprise services are being delivered. That means automating the provisioning of corporate services from IT support(ticketing system for laptop repair, for example) to human resources(onboarding and HR service delivery for new and existing employees) to customer service. In 2017, ServiceNow beefed up the look and feel of its systems by acquiring SkyGiraffe for mobile support and Telepathy for improving the usability of IT Service Management with consumer experiences. In 2018, ServiceNow unveiled its Kingston release, which incorporates new technologies like machine learning and anomaly detection into its Intelligent Automation Engine, which is designed to learn and improve from some 50,000 incidents regularly being processed by the ServiceNow system. ServiceNow expects to include other tools like natural language processing to make the system easier to run in the future. With more than one million customers, Alibaba Cloud is the China ecommerce giant’s response to AWS. Because of its leadership position in the Chinese tech industry, Alibaba Cloud has become the de facto Cloud infrastructure for a wide swath of the Chinese economy – merchants, manufacturers as well as export-driven companies. Building on that success, Alibaba Cloud has chalked up impressive growth by opening new data centers in different parts of the world, especially in countries like Singapore and Malaysia. In 2018, Alibaba Cloud is expected to drive innovation by investing heavily in AI, machine learning, natural language processing and computer vision technology. Alibaba Cloud is also positioning its AliOS-enabled cars, all running its own version of Internet of Things operating system, to ride a new wave of autonomous vehicles that are expected to hit the market in the next five to 10 years. FIS, which acquired SunGard in 2015, saw organic growth from the division that specializes in banking and financial management solutions. The SunGard division, now part of Global Financial Solutions, saw a 3% organic growth in 2017 slightly higher than that of its payments business. FIS invested heavily in the Code Connect environment to facilitate tighter integration among its product portfolio through readily available API interfaces. FIS expects half of its offerings in the US to take on this approach for modernizing its platform in 2018. In 2017, FIS spun off the public sector and K-12 education units of SunGard to focus exclusively on corporates and banking and financial institutions with a full portfolio of core banking, front-to-back office trading software and treasury and risk management applications. Because of its first-mover advantage, Athenahealth has enjoyed a solid and steady growth with its Cloud-based Electronic Health Record and Revenue Cycle Management products for providers. By using its software, providers pay Athenahealth anywhere between 2% and 8% of a practice’s or health system’s total collections, depending on their size and subscription services. Over the past few years, Athenahealth has been focusing on adding more value-added services such as patient engagement, while lowering its expenses. In February 2018, Athenahealth appointed former GE CEO Jeff Immelt as its chairman, leaving Jonathan Bush, its CEO and former chairman, more time to drive operational efficiency. Dropbox became the newest Cloud Computing Billionaire following a 31% jump in revenues to break the $1-billion mark in 2017. All told, the Cloud-based storage and collaboration application vendor recognized $1.1 billion in revenues last year from some 11 million paid customers, out of a total installed base of more than 500 million registered users in 180 countries. Much of its growth is expected to come from enterprise customers that continue to add new users, while leveraging add-on capabilities for unlimited storage, audit log, access permissions and admin consoles. The challenge remains converting non-paying customers, or 98% of its user population, to paid ones by carefully tracking the usage patterns of its new users and ensuring that they see value in upgrading to a paid subscription, as opposed to different storage plans offered by telcos, cable providers, ISPs, device makers, etc. As these 14 vendors are vying for dominance in the next phase of Cloud Computing market evolution, the future is fraught with uncertainty. The PaaS, IaaS and SaaS product categories are projected to reach $174 billion in total recurring revenues by 2022 based on our latest forecast. This is a milestone that underscores the popularity of Cloud Computing, especially when it comes to the Public Cloud that optimizes the placement of artifacts, objects and data in a multi-tenancy environment that eliminates hardware upfront costs for customers, while leveraging the economy of scale needed to serve millions of transactions, instances and/or users in real-time simultaneously around the world. 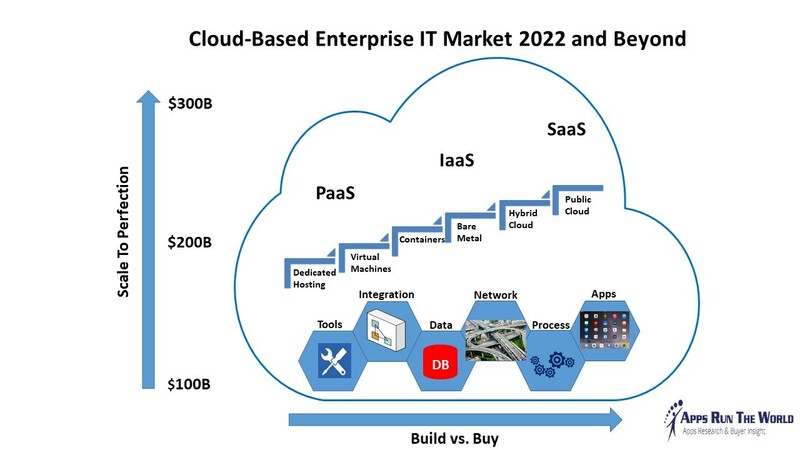 The next milestone is particularly significant because Cloud Computing could surpass the size of traditional on-premise Enterprise IT implementations as early as 2021, as shown in Exhibit 3. PaaS – Platform As A Service will be fueled by growth of Cloud platform products like 18c Database from Oracle(which became generally available in February 2018) and Amazon Aurora as customers migrate their workload to the Cloud. The steep growth of Mulesoft for Cloud integration, along with the renewed vigor of VMWare and Dell Boomi could breathe new life into PaaS. The same applies to the growing use of open-source tools from Cloudera, Hortonworks, MongoDB and others, all of which will drive the adoptions of AI, IoT, Machine Learning and Robotic Process Automation to new highs, thusly boosting the overall growth of PaaS through the forecast period. IaaS – Vendors are bolstering their IaaS offerings by tapping into more data centers, co-location and telco facilities that come online in order to cater to increased demand for real-time Cloud access. However pricing pressures as well as consolidation among REITs, data center operators as well as telcos could make it harder anyone to sustain their operations for long. Already, Rackspace’s decision to pin its future as a managed Cloud provider by piggybacking on AWS’ installed base suggested that the IaaS market may not be able to support that many vendors. Alibaba’s meteoric rise could also prevent AWS, Microsoft and even IBM from gaining a foothold in the lucrative Chinese market. What comes next is that IaaS could be controlled by a handful of super-regionals that would not cede ground to anyone until another round of brutal market shakeout plays out through the forecast period. SaaS – The Software As A Service product category remains highly fragmented as more than 3,000 vendors are vying for a slice of a market that has the potential of topping $100 billion in annual recurring revenues in the next decade. Still the entrenched presence of on-premise products in verticals like banking and financial services, healthcare, and even utility threatens to postpone Cloud migration for an extended period of time. The recent sell-off in Cloud vendor stocks – some of which are citing risk averse as the main reason behind customer inertia even after years of testing and running Cloud applications by some of the biggest companies – suggests demand for net new Cloud adoptions may be decelerating. In addition to the above drivers and inhibitors, there are a number of issues to contend with even for Cloud billionaires like Amazon CEO Jeff Bezos and Salesforce CEO Mark Benioff, both of whom are actual billionaires with the former already surpassing Bill Gates of Microsoft as the world’s richest person. First is how and whether these Cloud billionaires are going to prevail with an assortment of products for PaaS, IaaS and SaaS, all of which target a slightly different audience. The question is if they can win in all three as Oracle CTO Larry Ellison has repeatedly pointed out that his company is the only one capable of outsmarting its foes across all three because of its dominance in database and now enterprise applications after buying NetSuite. Second is how and whether PaaS, IaaS and SaaS will converge as Artificial Intelligence(AI), Internet of Things(IoT), and Mobility could usher in more sweeping changes to the Cloud marketplace. What’s possible is that AI, IoT, autonomous vehicles and other trends from sharing economy to augmented reality could disrupt the Cloud marketplace the same way Benioff’s revolutionizing software consumption by launching Salesforce.com in 1999 and ultimately undermining the value of on-premise applications. The next decade or two could fundamentally change people’s expectations of Cloud delivery. A convoy of connected autonomous vehicles parked nearby or on the go could provide continuous Cloud access. For example, in February 2017, Ford announced it would invest $1 billion in Argo AI to build self-driving cars by 2021. Such pods on wheels could also deliver services from shelter to transportation and from solar-powered energy to healthcare from mobile clinics or even office space, potentially putting makers like Ford, Tesla and Toyota in the driver’s seat as next-generation mobility redefines our lives. Then there is the specter of millions of companies and organizations entering the fray as they transform themselves digitally. Many of these entities are now positioning themselves as tech play by investing heavily in software development. According to our survey of 180,000 end-user companies in our Buyer Insight Database, for every dollar they spend on outsourced software technologies like an ERP package from Oracle and SAP, they are estimated to invest at least 40 cents on insourced apps. For such insourced development efforts, many of them have benefited from the ease and affordability of spinning up such apps with help from AWS and Azure. All major car makers like Ford are building more apps than ever on their own. The same applies to the likes of Bank of America, GE Digital and anyone that doesn’t want to be Uberized (as in vaporized by a disruptive force like Uber). If a fleet of self-driving cars can take someone from San Francisco to Los Angeles with less hassle than flying, what should airlines like American do in response? Developing more apps to improve customer experience may well be the answer. Ultimately, customers’ increased emphasis on Cloud development, which covers everything from Private Cloud to mobile apps, could proliferate and even become game-changing sometimes at the expense of the top Cloud Computing vendors. It’s fair to predict that the Cloud Computing pie will only get bigger over the next decade or two. What’s not clear is if everyone is going to get a larger slice than what they have today. PaaS – Platform As A Service covers a range of development tools like Java and Heroku, Integration products like Middleware for application deployment and integration, Data Management products like Databases, ETL, Data Warehousing tools, as well as System Software for change and configuration management. All of the above need to be delivered via Cloud services with hosting, virtual machine, container and private, hybrid and public Cloud subscriptions. IaaS – Infrastructure As A Service covers a range of Cloud services that are designed for anyone needing to outsource hosting, compute, container, bare metal server for input and output workload, virtualization, storage, backup and recovery, networking, load balancing tasks and other infrastructure services to a third-party provider. Security – Off-the-shelf security software delivered via the Cloud is not included in our Cloud Computing taxonomy as IaaS and PaaS service providers are embedding security into their subscription services, making it difficult to isolate recurring revenues for security from such bundling arrangements. Customers now come to expect security as standard Cloud Computing services, similar to what commercial landlords are bundling physical security, building upkeep and maintenance into leases for their tenants. Standalone Cloud-based Security products are being rolled into Other Enterprise IT Products. SaaS – Software As A Service covers a range of enterprise applications delivered via the Cloud for business functions and processes such as Order to Cash, Hire to Retire as well as industry-specific capabilities like Jail Management Software, Electronic Health Records as well as other apps for 21 verticals in our taxonomy. Cloud applications are derived from more than a dozen primary and secondary markets designed to automate specific and discrete business processes and functions generally used by a customer either within an enterprise or across multiple divisions of a vertical industry. Enterprise applications Analytics and BI Analytics applications cover business intelligence functions sold as a standalone application package for decision support or embedded in an integrated solution for functions such as revenue performance or for specific verticals such as healthcare performance management. Collaboration Collaboration applications include Cloud tools for Web conferencing, team collaboration, social business platform, event management, eSignature, and sharing of online community resources. Collaboration applications also include conventional tools for email, group calendaring, scheduling and threaded discussion. Knowledge transfer plays a key role in the Collaboration application market especially when it comes to adding value to Electronic Performance Support Systems(EPSS), which enable companies to better prepare and train employees and users with online guides in order to help them complete specific tasks and business processes. Next-generation EPSS can fill the gaps of team and unstructured collaboration, making intranets, project management, and other knowledge management tools more accessible. Next-gen EPSS will have the biggest impact on customer-facing systems like Salesforce Automation by making collaborative selling actionable as account intelligence, customer insights and buying preferences can be easily identified, shared and prioritized. The same applies to next-gen EPSS being adapted to deliver best-in-class customer service and support with precision, accuracy and user satisfaction. Content Management Content management applications include Web content management, document management, authoring tools, digital rights management, and search and portal functions that can be integrated into a business process via the Cloud. Customer Relationship Management Customer Relationship Management includes applications for sales force automation, marketing automation, customer service and support management such as email automation. Social Media Management, Customer Experience Management, Activity and Participant Management are among some of the newly available CRM applications available via Cloud delivery. eCommerce eCommerce applications include those designed for shopping cart automation, order management, inventory management, Web-based point of sale, multi-channel retailing, procurement, sourcing, and supplier relationship management. Enterprise Performance Management Enterprise Performance Management applications are designed for a range of budgeting, forecasting and planning business processes that span multiple functional areas from finance to sales. Specific applications modules include budgeting, planning and forecasting, financial consolidation, capital expenditure planning, activity-based costing, zero-based budgeting as well as sales and revenue forecasting. EPM applications revenues represent a major contributor to the Enterprise Resource Planning market as part of our market sizing exercise. ERP Financial Management ERP Financial Management software covers finance-specific business processes such as accounts payable, accounts receivable, general ledger, and fixed asset accounting, as well as online functions such as invoicing, factoring, electronic payments and financial reporting. FM applications revenues represent a major contributor to the Enterprise Resource Planning market as part of our market sizing exercise. ERP Services and Operations Management ERP Services and Operations Management covers integrated applications suites designed to automate a range of business processes from back-office operations to financial management and from sales order capture to customer information management. Currently ERP also covers functions not being addressed by other functional markets. Examples include Environment and Health and Safety, Governance, Risk and Compliance, as well as industry-specific applicatons for 21 verticals. Human Capital Management Human capital management includes such functions as eRecruiting (applicant tracking), Onboarding (employee profile), Performance Management (assessment, goal management, succession planning), Core HR (personnel administration, benefits, compensation management, payroll), Workforce Management (absence management, activity tracking, scheduling, time and attendance), and eLearning (learning management system). IT Service Management ITSM applications are being used to make a growing number of employee self-service functions possible through enterprise service management for asset, incident and project management. ITSM applications are considered a derivative market with revenue contribution to functional areas such as Project and Portfolio Management and Enterprise Resource Planning. Product LifeCycle Management and Engineering Product Lifecycle Management applications enable key stakeholders including designers, engineers and OEMs to gain and optimize visibility into the entire product life cycle from idea generation to collaboration and from product data management to iterative development efforts. PLM applications are considered a derivative market with revenue contribution to functional areas such as Project and Portfolio Management, Enterprise Resource Planning and Manufacturing. Project Portfolio Management Project and portfolio management (PPM) applications include those that automate and optimize the initiating, planning/scheduling, allocation, monitoring, and measuring of activities and resources required to complete projects. PPM applications also cover certain aspects of IT service management especially those that involve project portfolio management within the IT domain. Procurement Procurement covers applications designed for purchasing material (whether direct or indirect; raw, in process, or finished; as a result of or flowing into a product supply chain-specific business process; or in support of performing a service) and services (business or professional). Other functions include contract management, electronic network, punch-out, sourcing, and supplier rating to optimize the overall supplier relationship management business processes. Procurement applications revenues represent a major contributor to the Enterprise Resource Planning market as part of our market sizing exercise. Sales Performance Management Sales Performance Management tracks and automates different incentive compensation programs for salespeople as well as other functions specific to inside, outbound and channel sales activities including territory and quota management, account segmentation and scoring, and deal and quote management. SPM applications revenues represent a major contributor to the Human Capital Management market as part of our market sizing exercise. Supply Chain Management Supply chain management covers Inventory Optimization (Warehouse Management, Replenishment), Transportation and Logistics (Routing, Scheduling, Carrier/Fleet/Fuel Management), Planning (Advanced Planning and Scheduling, Forecasting, Supply Chain Planning through Execution), Distribution Management (Order Orchestration, Management, Global Trade Management), E-Commerce (POS, Store Inventory & Fulfillment, EDI). Treasury and Risk Management Treasury and Risk Management applications covers standalone and/or integrated products that automate business processes to support corporate treasury operations (including the treasuries of financial services enterprises) with the corresponding financial institution functionality and optimize related cash management, deal management, and risk management functions. * Cash management automation includes both discrete and interlocking treasury processes involving electronic payment authorization, bank relationship management, cash forecasting, and others. * Deal management automation includes processes for the implementation of trading controls, the creation of new instruments and asset classes, market data interface from manual or third-party sources, and others. * Risk management automation includes performance analysis, various metrics calculations used in fixed-income portfolio analysis, market-to-market valuations, energy trading and risk management, and compliance with regulations and standards such as European Market Infrastructure Regulation, Financial Accounting Standard, International Financial Reporting Standards, Single European Payments Area, and others.